A long time ago, while I was working as a barista to supplement my GI Bill and thus have the ability to buy food while going to college, I got into many interesting discussions with very many wonderful, fascinating people. I met feminists, weird cultists recruiting on street corners, quantum physics students struggling to accept a reality of uncertainty, political science students, people experimenting with new religions or drugs or sexuality… I made my first gay friends, my first Jewish friends, my first Atheist friends. At least that I knew of. What an eye-opening time, a beautiful reintroduction to America after a short career in the military, where most of these ideas would never be said aloud. One idea that I heard was that people could succeed if they worked hard, that everyone started life on an equal footing. This was from a young woman I worked with whose husband sold Amway. This, I understood, was part of their philosophy. At the time, I was working 50-60 hours a week and going to school. I was earning more than minimum wage, but just barely. I lived in a rooming house, none too clean or comfortable, and could not afford cable television. I did not yet know what anecdotal evidence meant, but I sensed there was something quite wrong with this position even beyond my own experiences, which suggested quite strongly that hard work does not translate directly into wealth and success. All this is an introduction to a critique of Atlas Shrugged, Ayn Rand’s capstone novel, and the marking point of her transition from novelist to philosopher. Even more, this piece has to be a critique of other peoples’ understanding of the work, and the way that understanding plays out today in political discourse. This work defined Ayn Rand as an objectivist, a sort of amoral philosophical position that takes its ethics from observable phenomena. Here the strong refrain from eating the weak, but also refrain from supporting them. The strong have arrived at their positions of wealth and authority not through divine intervention, as in medieval monarchy or Pharoanic ascendency, but through their own hard work and fitness. In the novel, these people, the creatives, are being coerced by a socialist government to hand over their hard-earned wealth to the state (and thus to the other citizens who have not worked so hard for their keep). One explicit force in this socialized government is big labor. Here Rand paints the titans of industry as the hard workers and the men, women and children toiling in factories as moochers, takers, intent on getting more than they deserve. What we really have here is a sort of social Darwinism, where people succeed or fail at life depending on their fitness to do so. The factory workers deserve to be factory workers, and the capitalists deserve to be rewarded for their investment of capital. Each has found their assigned place in life through selective forces. I will return to this idea momentarily. When my friend suggested we can all go to the top through hard work, this is what she meant. Hard workers earn money and can leverage those earnings into capital, then leverage that capital into financial success—i. e., wealth. In the novel, the creatives decide that it is their duty to remove themselves from the economy. Evil can only survive with the consent of the good; the good can only be sacrificed with their consent. They therefore remove their consent by going on strike. They stop funding their respective industries and collapse the socialist system by doing so. There is, implicit and explicit in this story, the theme of creation and ungrateful, undeserved dependents. The creatives drive wealth, the undeserving mooch off that wealth or demand it by force, through government authority backed up with guns. At some point, the people creating the wealth are responsible to stop feeding the hungry moochers, to stop creating more dependents. We can view this as both a moral and an amoral position (and some would contend that an amoral position is a necessarily moral one). From a moral point of view, consider the therapist who does not teach the patient or client to do without the therapist. The job security is nice, but nobody is really helped in this transaction. We do not merely soothe the client, but teach the client to self-soothe; we do not just cope for them, but teach them to cope; we do not just love them unconditionally, but teach them to love their selves, and thus to find this love in the larger world. Treatment must one day end, and preferably will end because the therapy-goer no longer needs us. Anything less is exploitation. But in Rand’s view, it is the patient exploiting the therapist, to their own harm. The therapist or the creative has to scrape off all the hangers on: the family that does not appreciate us, the government that taxes us, the plagiarists who do not create their own ideas. The amoral view is that the creative has no responsibility for their fellow human. Each is created to stand or fall on their own, according to their fitness to do so. When people fail in life, perhaps this is sad, but really no concern of those who stand, who succeed. This is actually the same view of Anton LaVey, the renowned Satanist: it is good and fitting that the strong dominate the weak. Much of Laveyanism is drawn directly from the works of Ayn Rand. Therefore, they shrug. 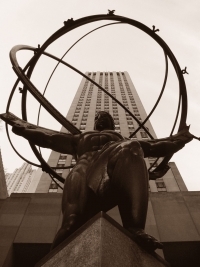 Atlas, knowing the more he strains to hold up the world, the heavier it becomes, has to put it down. Here we run into a problem with social Darwinists. They tend to be the very people who deny evolution, and who therefore are ignorant of how it works. This scenario has played out before. For 160 million years, the terrestrial fauna of the world were dominated by dinosaurs. Dinosaurs occupied every available niche, gobbling up all the free energy in the system, succeeding against entropy by so doing. They were the fittest for the prevailing conditions for all that time. Mammals existed, all rat-like creatures of various sizes, eking out a meager existence on the leavings of the giants. None was larger than a cat, and all were subject to predation by their betters. Then, 65 million years ago, the dinosaurs vanished. Their disappearance was quite sudden. Perhaps, it was in a literal flash, caused by a giant comet impacting the Earth. Perhaps, it took a few hundred thousand years, the result of disease as land masses shifted, oceans sank, and walkways made new places available to old monsters. Still, compared to the time of the dinosaurs from beginning to end, it was a rapid decline to nothing. What happened when the dominant form of terrestrial life left the system? Did all the mammals living in their shadows die from no longer having their production to mooch from? Quite the contrary: a large amount of free energy opened up in the system. Niches formally occupied were now open. Dinosaur diversity retreated to zero, and mammalian diversity rocketed skywards. There is now scarcely a niche on Earth absent of mammals. In Rand’s fantasy, perhaps there would be some short-term suffering as people were fired, science ground to a halt, art galleries closed. But I suspect it would be shorter than she thought. Quite soon, all the repressed talent in the world, living so far on the table-scraps of the “creatives,” would find an economy with gaping holes in it. Someone has to grow the food, mine the iron, build the skyscrapers. So they would continue to do so. New capital would come forward quite quickly, eager for the profit neglected by the old capital. And maybe a fairer system would come about (but quite possibly not). This is how evolution really works. The “fittest,” those at the top, are often at the top because they were born there. Each dinosaur did not work hard to evolve from a skipping tadpole to a magnificent behemoth: over thousands or millions of generations, its ancestors won the genetic lottery, over and over again. And so with us: each human did not build their wealth, but inherited that wealth from others, inherited the ability to become educated, to invest, to have something to invest in, from others. The struggle here is really between capital and labor. We are each born with the ability to labor, and have always labored, since the division of labor gave us money, for whoever could pay us for our work. Some are born into money, and some are born into education. A few achieve social mobility, but we mostly grow up and die in the social caste into which we were born. There is nothing special about the clever capitalist that makes him or her better than the rest of us. In America today, the best predictor of how much wealth you will accrue in your lifetime is how much your parents accrued in theirs. And the best predictor of whether you will graduate college is whether your parents graduated college. And this is the United States of America, bastion of freedom and classless society, the envy of the world. I suspect capitalism is dying. To protect it too much as a sacred economic system is perhaps to reify it. Capitalism is not a real thing, only an idea. Meanwhile, ecology is just as real. The farmer knows she can only take so much from the soil before having to give something back. The capitalist does not know she cannot take everything from society and return nothing, at least not for very long, before her profits must necessarily collapse. Our free market system is designed to mine us for every bit of wealth from the moment we are born to well after we are dead (funerals and probates and so forth are actually quite costly). But ours is a consumer economy, and thus an ecology: when the consumer has nothing to spend, the capitalist has nothing to earn. In other words, when the soil has no nutrients left, you can’t farm here anymore. The soil will not produce any more crops. It needs care from the farmer. It must be farmed sustainably. The capitalist eyes the profit margins. Pay workers as little as possible, sell the products or services for the highest price the market will bear, keep overhead down, pay nothing in taxes. But then, before long, who can afford the products or services being offered? Who can afford enough education to do more than toil in a factory? To innovate, create a higher quality of life? My friend from so long ago was wrong. Hard work will not lead us to wealth, and it doesn’t have to. While I am far from wealthy, I count myself among the rich: I can afford anything I wish to buy. It just so happens I do not wish to buy very much. What we struggle with here is established systems. The established wealthy in our country are like the dinosaurs, consuming all the free energy with no thought for the future. This affects us in psychology because this profit motive has infected our university system, corrupting our research, inhibiting our ability to provide help for those who need it. To reiterate, I cannot provide therapy to someone who could benefit from it, because corporate corruption has made it prohibitively expensive to do so, and cons said person into buying pills that profit the dinosaurs. All the free energy is directed to profit, not to helping one another.